Abrielle, courtesy of Tiffany and Jeff Santiago. Activism begins early in Asheville. 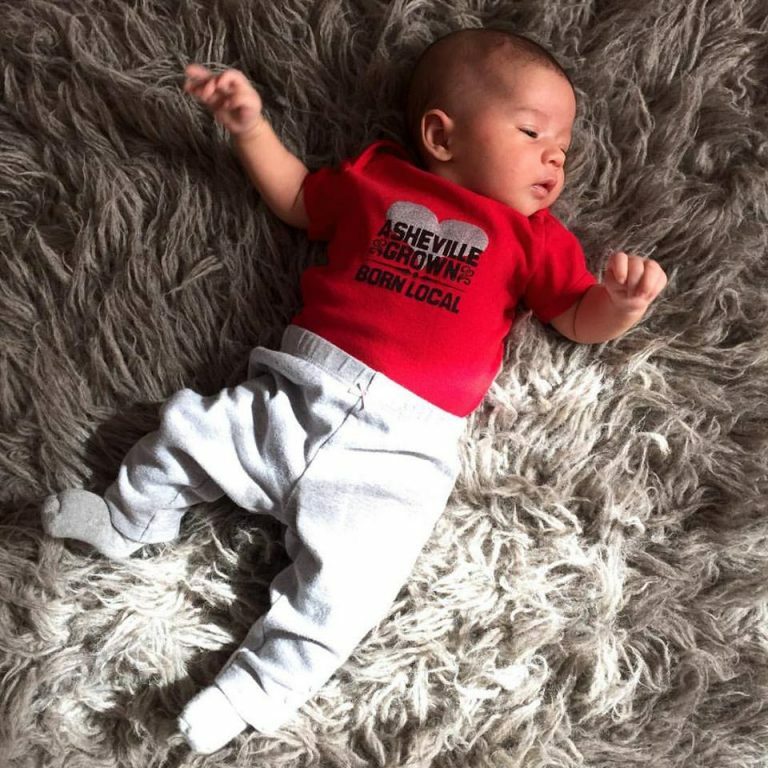 Abrielle shows her support of “Asheville Grown”, a buy-local initiative started by Franzi Charen. Julian Price planted seeds of inspiration that others now cultivate and continue to sow into the future. The restaurants he helped sponsor have now spawned other ventures. Real estate developers he worked with continue to think about how their work can create employment and city vibrancy. Pat Whalen and Joe Minicozzi, through Public Interest Projects and its offspring, Urban 3, have taken the story of Asheville’s resurgence on the road, providing a downtown revitalization template for cities around the country. 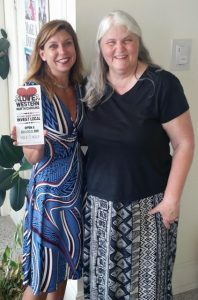 Kitty Love, executive director of the Asheville Area Arts Council, works to link art projects to each member of the community, recognizing the importance of beauty and vision for a thriving downtown. Mary Ann West and Downtown Asheville Residential Neighbors care for Pritchard Park, echoing Price’s understanding that natural beauty is an essential part of urban settings. Franzi Charen, founder of Asheville Grown Business Alliance, seems to channel Price as she works to help local businesses and entrepreneurs thrive. She knows, as Price did, that local entities’ success lends Asheville the quirky individuality that locals love and that draws 10 million visitors a year. Price helped others see Asheville as he did and inspired his generation and the next to dig in and create an environmentally healthy place where anyone can play a part. Julian Price never expected to change Asheville single-handedly. He wanted to help smart, creative entrepreneurs and organizations that were also dedicated to making Asheville a just and beautiful place to live. His work planted the seeds for Asheville’s resurgence. And the people who continue to help Asheville seem to hear Price whispering his encouragements in their ears. They are people like the restauranteurs who PIP (Public Interest Projects) encouraged and supported who have continued to create neighborhood spots. Joan and Joe Eckert of The Laughing Seed went on to found Jack of the Wood and Green Man Brewery. And Joe created City Bakery so he could serve bread at Jack of the Wood. The Brewery, founded in 1997 and now owned by others, has in 2016 opened a $5 million expansion that includes a specialty brew house, a retail shop, and a taproom loft. Its sour ale, Bootsy, won the 2015 Best in Show at the Carolina Championship of Beer–and seven other Green Man brews won awards as well. City Bakery, opened in 1999 (and now owned by others), has won the Best of WNC Award by Mountain Xpress from 2007-2014 for Best Bread, Best Bakery, and Best Breakfast Restaurant. Zambra’s current owners, Peter Slamp and chef Adam Bannasch (PIP continues to own a share), have also spawned offspring, wanting new neighborhood spots that create a sense of community. Slamp opened King James Public House (now closed) on Charlotte Street in January 2012 (Winner of the 2015 Asheville Wing Wars for Specialty Wings). And in October 2015, Bannasch and his wife opened Copper Crown, a New Orleans-influenced bistro in East Asheville. Former Zambra chef Josh Dillard and three partners have set up shop in their new restaurant and brewery, Bhramari Brewhouse, behind the Orange Peel. That turnaround is not just Price’s story but the story of many others like talented chefs, entrepreneurs, real estate investors, and artists who continue–either directly or indirectly–Price’s energy and success. Below are just a few narratives about those who, knowingly or not, honor Price– and Asheville–with their work. In 1990, Julian Price chose Pat Whalen first as his lawyer and next as his partner in founding Public Interest Projects, the for-profit development company that has funded numerous projects central to Asheville’s downtown comeback. During Price’s 11 years in Asheville and since his death, Whalen has meticulously enacted Price’s–and his own– vision of downtown. Whalen has done that in part by sharing with other cities the business model and systems that he and Price created, a notion that was part of PIP’s mission from the outset, says Whalen. As cities saw and heard about Asheville’s reformation, they began to contact PIP. “We were getting attention even before stories appeared in the national press about Asheville’s revitalized downtown,” says Whalen. “That led other cities’ leaders to contact us and ask how did you do that?” To tell Asheville’s story, Whalen has traveled to myriad cities–from Lancaster, Pennsylvania, to Flint, Michigan, to Panama City, Florida. The PIP model is an arduous, hands-on one, agrees Whalen: “What we did was really by working, working, working with whomever we invested in.” That’s the work ethic–plus thoughtful investment–that rewrote Asheville’s future. Public Interest Projects has invested more than $15 million in downtown Asheville. As early as 1994, PIP began to garner awards from the Preservation Society of Asheville and Buncombe County (1994, ‘95, ‘98, 2002, 2004); the International Downtown Association (‘99); the International Making Cities Livable Council (2000); Smart Growth Partners of Western North Carolina (2001); and the Historic Preservation Foundation of North Carolina (2002). In the early 2000s, Buncombe County considered building a jail or a 24-hour emergency vehicle center on Asheville’s South Slope, where old buildings that could be rehabbed for condos and businesses stood vacant. Concerned, Pat Whalen compared taxes per acre on similar facilities to those on mixed-use buildings. According to Minicozzi, Whalen’s study showed that if the county proceeded, it could lose $l million a year in tax revenue. Neither the jail nor the emergency vehicle center went up on the South Slope. And since then, the South Slope has become home to eateries, breweries, and mixed-use housing. Both Whalen and Minicozzi, hired in 2005 by Public Interest Projects as its new projects director, began taking the tax findings to various cities around the country. In 2009, Minicozzi addressed the National Smart Growth Conference in Seattle. Afterwards, attendees asked if they could hire him to do similar analyses in their cities. “That’s how Urban3 got started,” says Minicozzi of the consulting firm housed in PIP’s offices. Initially, Minicozzi worked alone. Now the firm has three full-time and two part-time staff members. In the next year, Minicozzi will share Asheville’s redevelopment tale and tax template in at least 20 cities, with a number of other events penciled in. Kitty Love never met Julian Price, but her vision for Asheville– melding art with social justice–seems right out of Price’s knapsack of visionary ideas about community. She moved here in ‘95, working as a tattoo artist. In 2001, she purchased an art gallery, Sky People Gallery and Design Studio on Lexington Avenue, where she rented booths to artists, acting as their broker and manager. That year, she also founded Arts 2 People, a nonprofit social service organization that provides professional development for artists, arts education programs, and more. Out of Arts 2 People, the Lexington Avenue Arts and Fun Festival (LAAFF) began as well, raising money for Arts 2 People programming. In 2004, Love heard that City Council had created a Downtown Social Issues Task Force, and one subcommittee, chaired by Pat Whalen, was focusing on graffiti. “I had been exploring a mural project,” says Love. “So, I crashed their meeting, saying I thought they should [establish] a legal wall [where] people could do graffiti as an art form. Instead of brushing me off, they asked me to join the committee.” The upshot: the Asheville Mural Project, which provided money for artists, including graffiti writers and painters, and helped open their eyes “to how their work could make the community better and solve problems instead of create them,” says Love. Pritchard Park used to be a mess. In fact, in the early 1800s, the space was a hog wallow, so almost any change was an improvement. Home to the city’s post office from 1892-1932, the land began life as a park in ‘32, and since the ‘60s and ‘70s, Quality Forward (now GreenWorks) tended the space, planting trees and flowers. But in 1980, the park evolved into a bus station and the “Wino Hilton”–a comment on the crowd of street people who hung out there. 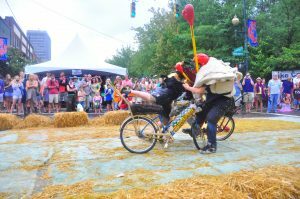 In 1998, the city knew it had to do something, especially since Bele Chere, a local street fair, was launching in 1999. The City relocated the bus station to Coxe Avenue and began renovating Pritchard Park, creating a mini-amphitheater, adding park and sidewalk space. But as the park’s opening ceremony approached, the city ran out of funds for benches and shrubs. That’s when Price stepped up, spending his own money to complete the park. Where others saw an eyesore, Kitty Love saw opportunity. 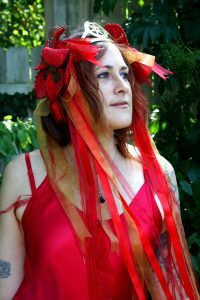 In the late ‘90s, Arts 2 People began a Pritchard Park Cultural Arts Program bringing music performances, aerial arts, and [hula] hooping into the park, says Love, Arts 2 People founder. The process, called creative placemaking, was something Julian Price would have appreciated, says Love, noting that creative placemaking always capitalizes on a sense of place: “It looks at culture, history, neighbors, values, expression, and economy, and uses those powers [and the arts] to change outcome,” while allowing artists to develop professionally. Police calls about the park dropped, families began using the space, and neighbors–at the suggestion of the late Trina Mullen– created a conservancy called The Friends of Pritchard Park. Mullen, after a corporate career, worked for Greenworks and linked up with West. Both understood that the 2007 recession had gobbled up any renovation money. So, Mullen threw the park an 87th birthday party for the park at S&W Steak & Wine on Patton Avenue, newly opened by Asheville developer Steve Moberg. Celebrants paid $50 at the door and bid for items in a silent auction. After expenses, Mullen and West had raised $6,000 to $7,000. “We bought 23 planters to put along the park walls,” says West. Over time, West’s and Mullen’s roles evolved: Mullen became the fundraiser, and West the worker bee. Still, Mullen was at the park daily, says Roderick. One project she seized on: the park’s fountains. “The city had put in two water features after the buses moved, but they never worked,” says Roderick. “So, [in 2012], Trina took that on.” She raised $11,000 to improve the park’s seating space and create a new mountain waterfall, designed by local stone artist Jill Haynie and now called Trina’s Falls. Mullen and West didn’t begin their joint endeavors with the park. They had also co-founded Downtown Asheville Residential Neighbors (DARN) in 2005. West, concerned about downtown issues, put an ad in Mountain Xpress inviting downtown residents to meet at Asheville Savings Bank on Church Street. Thirteen people showed up, including Mullen, who volunteered to chair the new organization. “She was its driving force,” says West. About 65 downtowners now belong to the association, which, along with West, cares for the park. 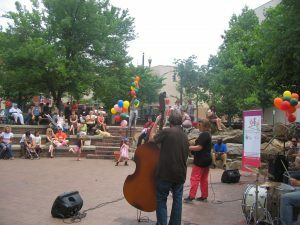 Although the park continues to face difficulties, its gardens thrive and its summer cultural programing, initiated by Kitty Love, continues through The Asheville Downtown Association. Love, Mullen, and West –like Price–didn’t wait for others to address community concerns. They turned their love for Asheville into actions, empowering others to act as well. Thirteen years later, Charen–now co-owner of the Lexington Avenue shop Hip Replacements–is still “in love” with Asheville. Like Julian Price, she has put her brains and muscle where her love is. In the fall of 2009, she learned that Urban Outfitters, a chain based in Philadelphia, was opening a store on the corner of College and Haywood Streets. She and other Lexington Avenue merchants met, seeking ways to promote locally-owned stores. Soon after, Charen came up with a solution. For three years, the Alliance helped run the Big Love Fest, which drew eight to ten thousand people and 20 bands to Asheville. In March 2013, with Self-Help Credit Union, the Alliance created a Go Local CD program, which has raised and lent more than $2 million to locally-owned businesses or for home mortgages. And in 2012, Go Local partnered with the Asheville City School Foundation, creating a Go Local card offering discounts at participating local businesses, dropping the Foundation’s Florida-based fundraising project that had kids hawking fast-food coupon booklets. To date, the Go Local card has raised more than $45,000 for local schools. Julian Price shaped Asheville with a spirit of renaissance, generosity, social justice, and beauty–and, as Charen says, with conviction. 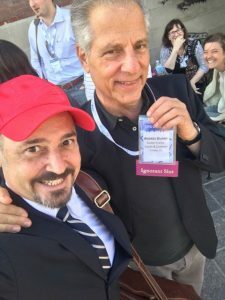 People and projects he nourished now spawn new businesses and continue to connect the economy with liveability, the environment with beauty and health. Some transforming entrepreneurs knew Price, others did not, but he and Whalen created a template that others continue, making Asheville almost as exceptional as Price was.